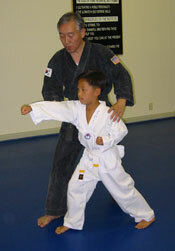 For many reasons, Tae Kwon Do is an excellent activity for young children. Before new students sign up with the school, each has an introductory class and interview with Grand Master Yee. In this time, he determines the student's individual strengths and weaknesses. Then the interaction in the class is customized for each individual child. Introductory classes are small and are a comfortable environment for children to learn in. The school emphasizes learning at all ages, and at all belt levels. In his classes, Master Yee reminds children that the best way to learn is to "watch closely, and listen carefully." From the very first class, students are shown how to learn independently, and to teach themselves. A valuable lesson to take with them throughout their life. The Young Yee Martial Arts Center is a truly unique environment in which no child is left behind, and no child is unchallenged. Please call or come by the school to learn more about how Grand Master Young Yee can help guide your child's development, improving performance at school, and behavior at home.